Recently we launched a new to do list app called Goalie, and we’ve got to be honest: we think Goalie is pretty special. 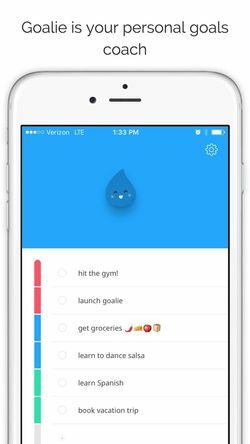 Why do we think that Goalie is one of the best to do list apps out there? 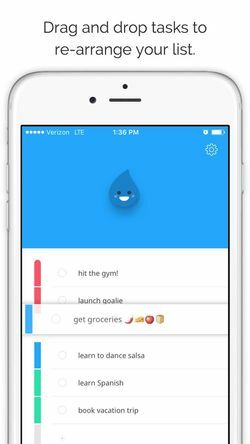 While Goalie sits among stiff competition with the likes of Any.Do, Evernote and Apple Reminders (in addition to the classic notepad), we think Goalie fits a user niche not yet tackled. What makes Goalie special isn’t the sheer number of hours it took to build Goalie. Goalie has a minimal UX that ended up taking us only a few week from start to finish. It isn’t the integrations, multi-level hierarchy, ability to collaborate on tasks or the use of 3D touch (yet) either. 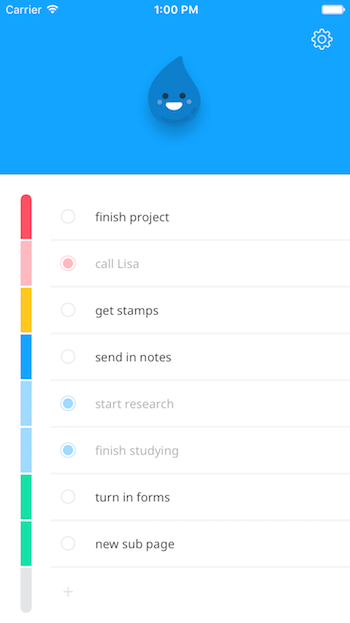 We think what makes our new to do list app special is how it combines simplicity with gamification. Before diving into our final approach, we should touch on our first (fast failed) idea. Goalie began as a “build a polished app in a week” challenge for our development team that not only was a good test of our capabilities, but also helped our development team learn more about the UX process by actually owning for a change. 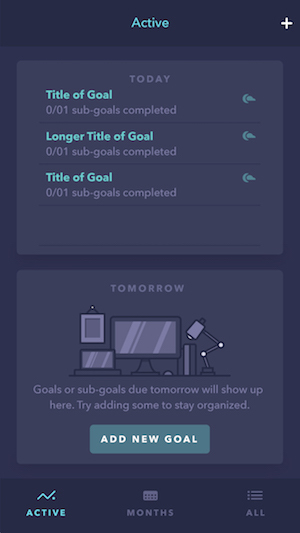 Our idea was to create a goal planner tool, helping users plan out due dates for life goals and accomplish them by breaking them down into sub-goals and assigning those sub goals to a today/tomorrow view in order to mark them off, one-by-one. In retrospect, we admit that sounds a little complex. While we did manage to complete the app within the week, we received feedback from our users that made it clear that we had to pivot if we wanted to launch a successful to do list app. After listening to the excellent critical feedback our designer came up with, we decided to change direction and start anew. Read more about how our designer, Sam came up with the idea for Goalie 2.0 on her blog and learn about how our lead developer, Greg was able to sucessfully make the pivot from Goalie 1.0 to 2.0 without losing much in the way of time in an earlier Incipia post. 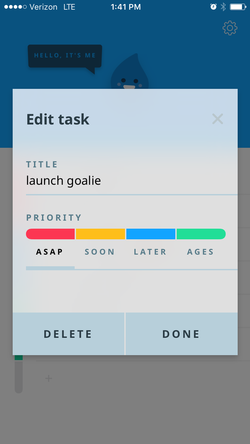 Goalie 1.0 Goalie 2.0 With the new direction of Goalie, we took a gamble on building an app for a specific niche of to do list users: the people who prefer a notepad to a scheduler; who take simplicity over features. We bet that our target user would be happy forsaking the bells and whistles for a dead-simple UI that guaranteed no friction to using the app for its core purpose: jotting down a list of to do items, just like our target user would do on her or his notepad. Yet re-creating the notepad, which is perfect in its simplicity would be as pointless as re-creating yet another feature-rich to do list. So we also wagered that these users would be willing to try a notepad-like app that held something else up its sleeve, something to make them smile whenever they tapped our app’s icon and loaded it up, so long of course as the core functionality wasn’t diluted.Our solution was to personify that something in the form of Goalie and make the act of managing to dos into a game, with the aim of deepening the enjoyment our users get from crossing things off their list, all while not losing sight of the simplicity of the notepad our users know and love. Making him look pretty darn cute couldn’t hurt either :) All that aside, some of you notepad purists may be quick to point out that there is one piece of functionality, aside from the element of gamification, that does make Goalie more than just a fun, simple notepad; that is true. The priority thermometer concept was our way of powering the Goalie game (he changes colors depending on task priorities) without having to add a UI to keep track of stats. We also want to honor an important part of the process of task management that a notepad can’t help users with, which is to make tasks items timely. That said - we left our users the option to disable this feature in the settings and added a drag-and-drop functionality to let users still self-prioritize by re-arranging items on their own, agnostic of the thermometer concept. We can probably all agree that drag and drop is one thing a notepad could benefit from, right? Lastly - our sound designer Nico took the time to include a few sound effects that we think add an extra layer of polish and more fun to Goalie.